“Oh God. Oh God. I’m hallucinating, probably have a fever, and I need to get out of here now.” She nodded as she said the last word as if it finalized her babbling, confirming an inner argument of some sort. “I don’t think you’re suffering any ailments. You can keep gawking at me all you like. Although, I would prefer if you looked a little higher than my feet.” Much more impressive, that. At least, no one had ever complained before. She made a derogatory noise in the back of her throat. “Please tell me you’re some D&D nerd in a really well-made costume and you mean me no harm. Also, if you have a cell phone, I would really appreciate it if you don’t take my previous comment personally and let me borrow it for a moment.” Ah, well, that solved one of his concerns; if she had no phone, she couldn’t have sent evidence or contacted anyone about what she’d seen. Unless, of course, she had a camera stashed somewhere. I should probably frisk her to find out. He crossed his arms. “This is not a costume.” Ariston narrowed his eyes, a thought occurring to him. “I didn’t sense you being attracted by my song like I did the blonde. Are you a magical being? Who are you? A deity? A demigoddess?” He was on to something there, but wasn’t sure what. Had she brought the freak thunderstorm the night before? There had been no sign of rain, yet rained it had. And hailed on top of it. “I don’t have a phone on me. Where would I put it? In my leg hair?” He lifted a hoof and waved it in a counterclockwise motion. Brunette’s eyes widened once more. Why did everyone get all worked up over the hooves, but not the horns? Those mostly received a pffft reaction followed by a series of retorts about his nature of “horniness.” It’s not like he would start making goat noises and chewing on buttons. The only part of his anatomy of any real importance hung heavily between his legs, and that was as human as any mortal man. Except he liked to think he was better endowed. “In your, uh, gun holster?” Brunette pointed to his panpipes. “What about it?” Ariston asked. “You asked where you would put a phone. There is a large pocket on your strappy purse thingy.” She nibbled her full bottom lip, an act that shot fire to his groin. “It is.” The twinge of lust faded out as he noticed the blood spotted bandage across the palm of her hand. “How were you injured?” Ariston took an unconscious step toward her. He had medical supplies at the cabin. Though he healed at phenomenal speeds, his blood still made a mess when it flowed on the wrong side of his skin. He could patch her up in no time. She glanced at her palm, almost surprised to see the bandage there. Then she shook her head and said, “Yeah, this is the weirdest conversation ever. Sorry, but…gotta dash.” She darted off in the opposite direction. As she sprinted away, stinging drops of water began to bombard his skin. Brunette had to be the one manipulating the rain, but how? What was she? It must be linked to her emotions somehow, and it made him wonder what had happened to provoke the furious assault from the elements the night before. Ariston snapped out of his stupor and chased after her. “Hey, not so fast!” A thought started taking root in his mind. He’d been excited about her before, but if he was right… Gods, he couldn’t let her escape. Not if there was a chance. Brunette was magical in nature, affecting the elements. The timing was too good to be true. 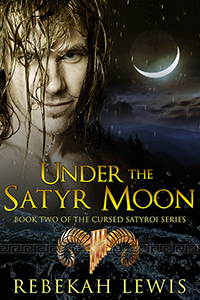 Ariston had sought one of her kind for as long as he’d been a satyr, and if she turned out being a nymph, she was also his savior. Unfortunately, his salvation continued putting distance between them. She may have the upper hand in the rain, but he knew the forest well. He’d capture her like the legends of old, and she’d be his. Mine!